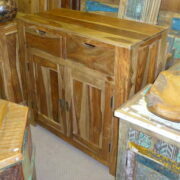 Sideboard made to fit around chunky old door with simple floral detail and thick hardwood top. 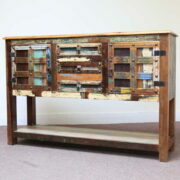 A piece made to fit around a pair of chunky antique doors, this sturdy sideboard is both eye-catching and practical. The thick heavy duty doors, salvaged from somewhere in Rajasthan, have a thick square frame and their original metal work and ring handles, giving them a strong rustic look. The back of the doors are a real treat, worn wood is intertwined with thick metal fixings, telling a story of age and use. The finish is of the doors is mostly golden brown natural wood grain though there are flashes of bright green paint, long since worn, betraying the doors more colourful history. 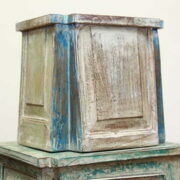 Above the doors is a simple floral detail that adds decoration while remaining true to the rustic character of the item. Inside there is just one internal shelf with no vertical divide, leaving two large spaces for storage. 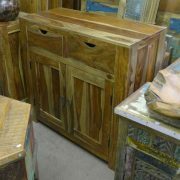 The newly made body of the cabinet has a beautiful natural finish that matches the tone of the old doors. 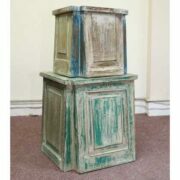 Another special feature of this sideboard is the thick, decoratively moulded hardwood top which rounds off the item wonderfully. 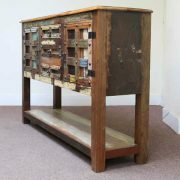 Perfect for a large hallway, dining room or to add character to a business, this sideboard is sure to last and draw attention for years and years to come.